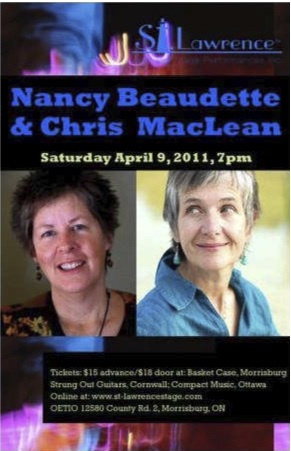 Whether sharing the stage or performing solo, artists Nancy Beaudette and Chris MacLean delivered a concert at the St. Lawrence Stage on Saturday, April 9th, that literally won hearts – and also a new group of fans. Beaudette offers empowerment workshops when she isn’t on stage. Her theme “run, fly, soar” frankly struck me as exactly the right description for the musical experience she and MacLean offered the audience Saturday night. The two musicians, both recipients of major Canadian music awards, each with successful albums out, backed each other up both instrumentally and vocally. They have worked together before, and it showed in the way they were comfortable with each other on stage and in the effortless blending of their voices on songs like “A Million Reasons to be Here with You” and “Make My Feet Be Still”. Yet as solo performers, the artists have unique, personal approaches. Chris MacLean’s music is often poignant. She has known love and loss and her very thoughtful lyrics and vocal style reflect this. 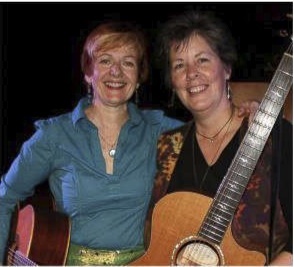 MacLean has performed in Africa taking her music to Tunisia and Morocco. She has seen desperate children, hungry children, children for whom the world is not a kind place. She reflects on social matters like these in her music, but never, as she herself puts it, in a ‘preachy’ way. There is a real flavour of Nahsville, and traditioanal country in MacLean’s strong clear voice. She sang a Gillian Welch song, with its ironic undertones, following it with what was almost a ballad, “Sisters of Charity”, about a betrayed Cree woman in the 1840’s. The musical style of Appalachia seems ideally suited Chris MacLean’s voice. Nancy Beaudette has a strong background in gospel music, for over 20 years writing and singing for the church. The open, rich, full voice gospel style seem to be reflected in her approach to music. Whether she was strumming a ukulele in a short medley of old favourites, or delighting the audience with an upbeat bouncy spring song “You’ve got a step in your swing / You make the robins and the daffodils jump up and sing” her voice was an instrument itself. Beaudette is an Eastern Ontario girl, born and bred, and she has kept those roots in her music. There are memories of childhood, old friends, old places in her music. “South Branch Road” is just one example. It is a song about the line outside Cornwall where she grew up. “The South Branch Road winds and rollls, Like the river that flows by its side. I can trace the years from my birth to here / right down the centre line”. The Chris MacLean, Nancy Beaudette concert was a memorable and highly enjoyable one. When they performed, one could not miss the sense of optimism which seemed to run through their music. Almost a sense of joy. The audience at the St. Lawrence Acoustic Stage was attracted right from the beginning. Written by Morrisburg Leader Staff Writer.